During this maintenance window, software in some of the campus core network switches will be upgraded. This is an advisory notice only; no downtime is anticipated due to network redundancy. If unexpected behavior were to occur, network services to the BMU could be briefly impacted. 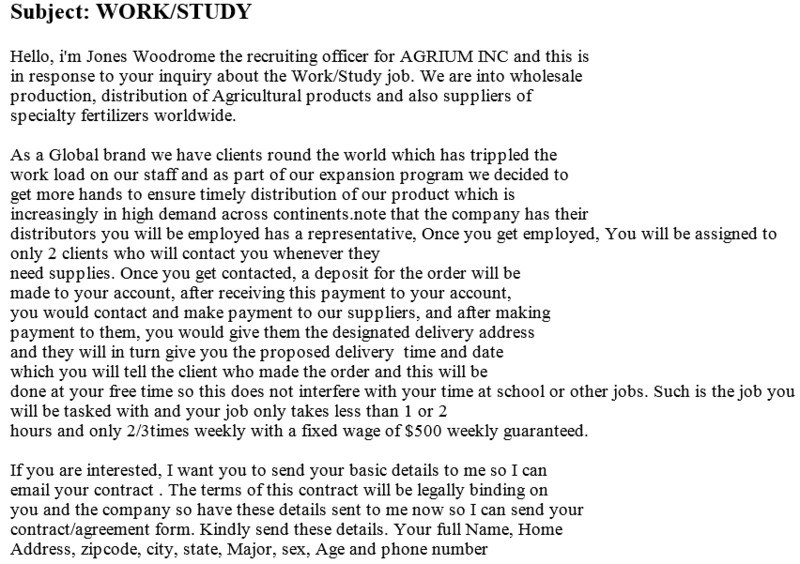 CSU, Chico students are often targeted with scams promising jobs. 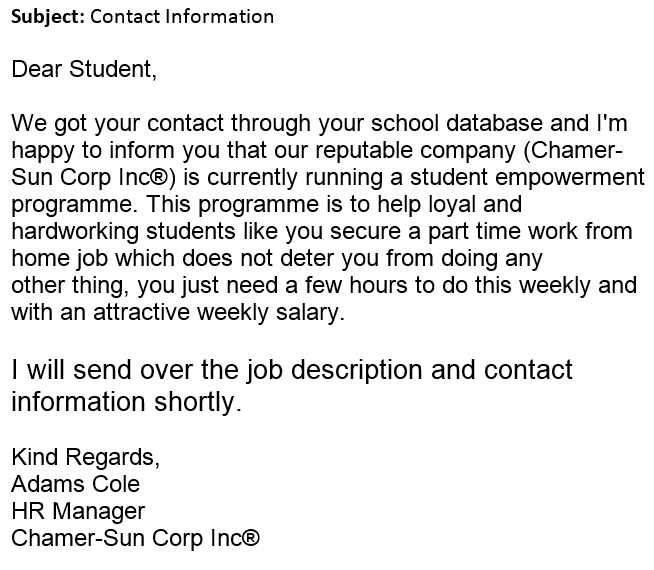 Students have been scammed out of money or had campus accounts compromised by job-related phishing scams. ITSS recently used PhishMe to raise awareness of this type of scam. We modeled the PhishMe campaign after an actual job scam that had recently targeted CSU, Chico students. The campaign was a “double barrel” format wherein an initial email references a forthcoming email to build trust. The second email will attempt to obtain account credentials, personal information for identity theft, or will request payment for materials needed for the fake job. Ask you to click on a link or open an attachment. Evoke strong emotions, like greed, jealousy, or fear. CSU, Chico will never ask for passwords or other sensitive data via email. Always check the URL of the site you are visiting. In many instances, a phishing email will direct you to an imitation website that appears legitimate, but attempts to steal your password or other sensitive data. 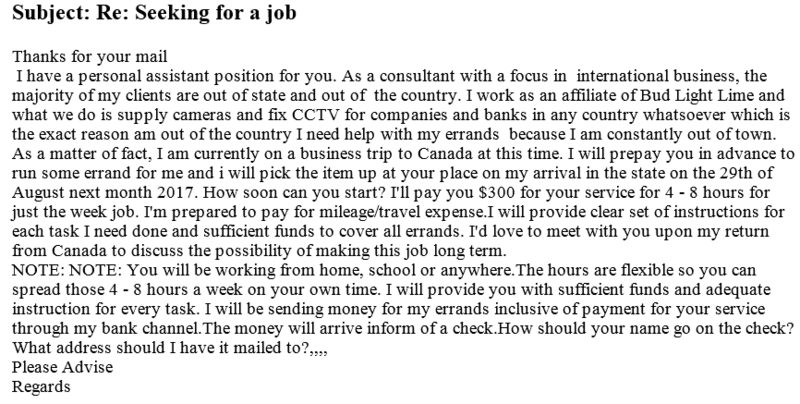 If an email or job offer sounds too good to be true it probably is. Most legitimate jobs do not require you to pay money or send personal information via email. Don’t hesitate to check with ITSS if you are unsure about the authenticity of an email you’ve received. On Tuesday, August 1st at 8:00 AM ITSS will be deploying new settings to campus Dell desktop computers. These new settings will be enabling a feature called “Auto On”, which will be set to automatically power on computers every Wednesday at 2:00 AM. This feature will ensure computers that are turned off get necessary security patches and updates, as well as the latest virus definitions. Users will not need to do anything for this to take effect, it runs silently and does not require a restart. We will exclude labs, laptops & servers, as they have different power and scheduling needs.